Despite all that's going on the Middle East – the Iranian nuclear buildup, the violence in Iraq, the shaking of Erdoğan's rule in Turkey, civil war in Syria, Egypt and Yemen in melt-down mode, Libya unraveling, Tunisia in political crisis – U.S. Secretary of State John Kerry has one main thing on his mind, and that's a Palestinian-Israeli accord. Unbelievably, he is paying a twelfth visit to the region on Jan. 13 to pursue this goal. "We believe that in return for Israel's request to extend negotiations by a year, Abu Mazen [Palestinian Authority President Mahmoud Abbas] will ask more of Israel, such as a [settlement construction] freeze or another prisoner release, and these demands will be backed by Kerry and turned into an American demand, accompanied by a threat. 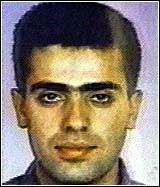 This, while the Arabs have never given anything in return, from the Oslo negotiations until today." "The negotiations are currently being carried out without papers or documents passing between the sides. This is because the Arabs are refusing to present written documents. The Americans are coming with prepared proposals, they read them and do not leave documents with either side. It is all done verbally. The Netanyahu government is cooperating with Kerry's initiative with the clear knowledge that the Arab side will not accept the agreement and ultimately [Israel] will not be required to make concessions or evacuate settlements." "Israel is forced to cooperate with the American plan, mainly out of concern that if we reject it, the U.S. will blame Israel for the failure of the negotiations." "The conduct of the U.S. secretary of state is obsessive. There are those who say that more than wanting to advance peace, he wants to take advantage of the conflict for his political needs. According to this line of thought, Kerry seems to think his path to the White House is via the signing of a Middle East peace agreement." "Kerry, U.S. Ambassador to Israel Dan Shapiro and U.S. Special Envoy Martin Indyk are wandering around the country, meeting ministers, briefing journalists and creating a feeling that a peace agreement is about to be signed." Kerry's security plan for the Jordan Valley is "ridiculous and unable to withstand the test of reality." "Kerry visits here a lot, but he does not display any understanding of what is happening here. The U.S. plans are superficial and not serious. There is no connection between what is said in public about the progress of the negotiations and what is actually happening. It seems that Kerry is just not in touch with reality. He is not an expert, to say the least, on the roots of the conflict, he does not know how to create real solutions and does not even demonstrate proficiency in reading maps that are presented to him." John F.Kerry sharing an thoughtful moment with Martin Indyk. 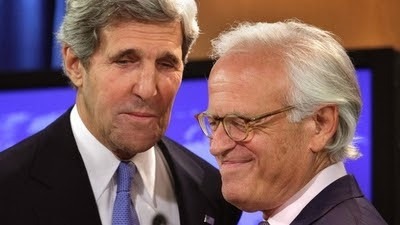 Technorati Tag: Israel and John Kerry and Martin Indyk and Peace Talks.